German composer Ludwig van Beethoven. 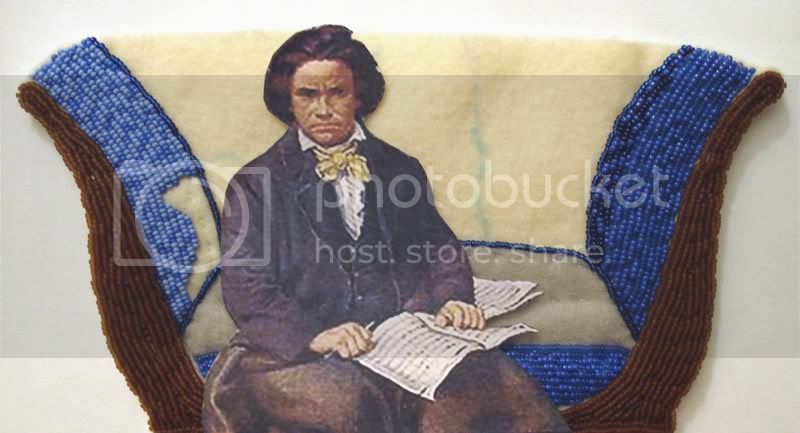 Beethoven had a rough childhood. Young Ludwig was often dragged out of bed by his drunken father who forced him to play music for his friends. Ludwig’s musical talents came forth at an early age, and he gave his first performance at the age of 7. His father recognized his talent, and unsuccessfully tried to exploit his son as a child prodigy. Then, both Ludwig‘s mother & sister died when he was 16. He was then forced to raise his 2 younger brothers as his father’s alcoholism had worsened. Beethoven launched his career by working as a freelance composer & musician, rather than working for the Church. His music was groundbreaking in terms of both technical and emotional impact. He was also viewed as one of the most important transitional figures between the Classical and Romantic eras of Western Classical music. And, he studied with Wolfgang Amadeus Mozart, who many consider to have been the world’s first rock star. Beethoven started to go deaf in his 20’s, which led him to think about suicide, and he also experienced periods of depression. He often fought with his family, and treated others with disrespect. And, he had strange personal habits, such as wearing dirty clothing, even though he bathed frequently. And, lastly, he became quite a public figure. When he died in 1827 in Vienna, Austria, it is estimated that somewhere between 10,000 and 30,000 people attended his funeral. Now, after learning about Beethoven and seeing paintings of him at different stages of his life, which modern-day rock star does he remind you of the most, and why? >Beethoven is one of my favorites. In fact, he and my son share a birth date (Dec. 16th) albiet several years apart. LOL Glad to see him front and center on this neat little couch. >Oh, Beethoven! “Roll over Beethoven … aaaaah”! 😉 I have some CDs with his music. He wrote Ode To Joy when he was alredy deaf, as far as I know. Hard to believe but true. I have seen a good documentation about him recently. >Pheonix, I think you nailed that one. LOL! >Lookin’ good! LVB kinda reminds me of Meatloaf! >I am so in love with this sofa and really in love with its cast of guest sitters. >The couch is coming along rather nicely! I see you’re almost done. Looks good.You know who might look good on the couch…KISS!